Before we get to the recap, I just wanted to bring up something I was reading on Twitter after last week’s episode and that is all the Lois Lane bashing the show does from Cat to Lucy. Supergirl please stop bashing my favourite DC character. Now on to the recap. After Winn declared his love and Kara still wanting to be in the friend zone, things are definitely frosty between the two, much to the chagrin of Kara. Kara is trying to make things the same but alas Winn just wants some space, which she eventually gives. 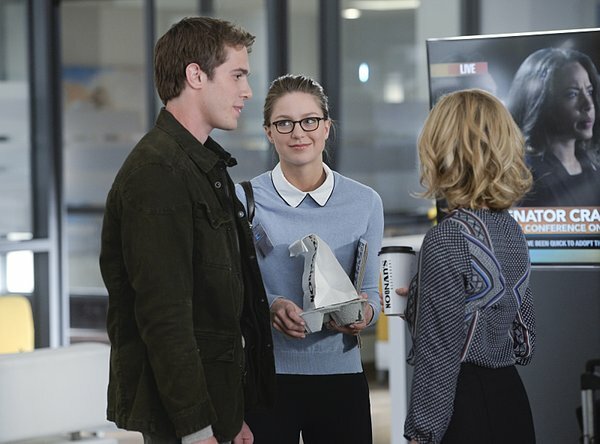 At Noonan’s we see a handsome man (Blake Jenner) flirting with Kara as the two discuss Cat Grant as a boss, with Kara defending her while the young man kind of bashes her. Later at CatCo, Cat sees this young man in her office and while surprised is happy to see him. This young man s her son Adam, the one she let her ex raise. Seems Adam received a letter supposedly from Cat reaching out to say she regrets not being their for him. Cat pretends that she wrote the letter and agrees to have dinner later. Cat is livid that Kara wrote Adam without her knowledge and fires her but once Kara gives her reasoning about having a second chance to know her son while she won’t have a second chance with her own mother, Cat unfires her. At the dinner, it doesn’t go well as Cat just talks about herself. Adam is unimpressed even after her attempts to ask about him turns into something about her after he reveals he dropped out of his Master’s program at Cornell. Back at Cat’s office, Cat is upset at how the dinner did not go well. Kara gievs some word of encouragement and the three of them meet at Noonan’s over coffee. Cat and Adam have an honest conversation with Cat regretting not being their for him. Adam asks if Cat ever missed him and she says that she missed him everyday and he replies that he missed her too. It looks like these two are slowly mending years of hurt. Later, Adam decides to stick around National City for a while and asks Kara out on a date. James as volunteered to cover Senator Miranda Crane’s (Tawny Cypress) rally on her anti-alien initiative. During the rally, James notices something flashing by his camera and all of a sudden. All of a sudden a white alien attacks the senator and her guards. James uses his super watch to call in Supergirl who arrives on the scene. When the alien reveals itself in front of Hank and Alex, Hank freezes and gets flashes of Mars being destroyed by the very same creature. When the creature disappear into a parking garage, Supergirl only finds the senator there, who was whisked there by the creature. Back at the DEO, Hank reveals to Kara and Alex that the creature is a white martian and was responsible for the destruction of Mars. Hank believes the white martian attacked the rally to lure him out because it sensed him after he impersonated Maxwell Lord. Hank knows that if reveals himslef as an alien then the DEO will go into the hands of General Lane, which no one wants. Senator Crane is at the DEO for her own protection but when Kara and James are going over the photos of the rally. they notice the senator’s eye glowing indicating the white martian has shape shifted using her form. Crane is talking to Hank implying that Supergirl isn’t the only alien at the DEO. Hank noticies Alex on high laert and makes for his gun but the white martian knocks Hank out and kills several DEO agents before getting away despite Supergirl’s attempts to take it down. Hank then tells Alex how the white martians destroyed his people with a holocaust and his wife and two daughters were killed. Hank feels extremely guilty that he is the lone survivor from Mars. Alex says he has nothing to feel guilty about but Hank wants to ease his guilt by killing the while martian. Alec and a team of DEO agents are looking for the real Senator Crane while Hank goes after the white martian. However, both team find Senator Crane but the Crane that Alex finds is the white martian and uses Alex as bait to lure J’onn J’onz out. The meeting place is the desert and white martian and green marian go at it with an assist by Supergirl. When the white maritian is taken down, Hank puts kryptonite handcuffs on Kara to prevent her from stopping him killing the white martian. Kara manages to talk J’onn down and we see the white martian in the DEO prison vowing that more of them in fact millions will come. Supergirl pretty much tells it to bring it. Later at a press conference, the real Miranda Crane reverses her anti-alien hate and instead says that we should welcome aliens. The reason for her 180 is that Supergirl saved her and that not all aliens are bad. Meanwhile, back at Kara’s. Kara and Alex are talking about her date with Adam but stop in their tracks when a news report breaks about a Supergirl save happening right now. Kara notes that isn’t her ont TV right now. Looks like we will get Bizzaro Supergirl and Melissa Benoist possibly playing a dual role.